Matchbook Holder – Vintage, plastic bowl used on the bar to hold matchbooks for patrons. Made by Claremould Plastics Company of Newark. 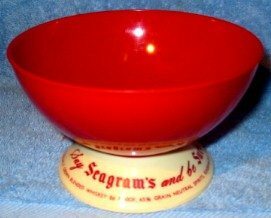 Larger lettering says “Say Seagrams and be Sure”. Bowl is 5 1/2 inchs in diameter and it stands 3 1/8 inches high. Real nice shape.